"Calling ghouls and goblins of all ages! This 'spooktacular' dessert features an OREO Cookie crust topped with a creamy combination of chocolate pudding and whipped topping. 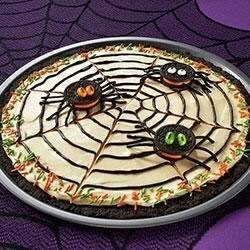 A chocolate spider web and a few cookie spiders add the perfect finishing touch." Crush 22 cookies to form fine crumbs; mix with butter. Press onto bottom of 12-inch pizza pan sprayed with cooking spray. Bake 4 minutes; cool. Meanwhile, microwave semi-sweet chocolate and 1/2 cup whipped topping in microwaveable bowl on high 30 to 40 seconds or until chocolate is completely melted and mixture is well blended, stirring after 30 seconds. Cool slightly. Beat pudding mix and milk in medium bowl with whisk 2 minutes (pudding will be thick). Stir in remaining whipped topping; spread onto crust to within 1/2 inch of edge. Spoon chocolate mixture into resealable plastic bag; snip off small piece from one bottom corner of bag. Use to drizzle chocolate mixture in spiral motion over pizza. Gently drag toothpick through lines to resemble spider's web. Refrigerate 1 hour. Meanwhile, decorate remaining cookies with licorice pieces and candies as shown in photo, using frosting to secure pieces to cookies. Place decorated cookies on pizza just before serving. Garnish with sprinkles. Variation: Prepare as directed, substituting a foil-lined 9-inch round pan for the pizza pan. Use foil handles to remove dessert from pan before decorating. Nutrition Information Per Serving: 220 calories, 11g total fat, 6g saturated fat, 10mg cholesterol, 210mg sodium, 29g carbohydrate, less than 1g dietary fiber, 21g sugars, 2g protein. Fun and easy to make! Only problem I came across was the oreo crumb bottom did not hold together. What a disapointment. It was really easy to make. I made the spider legs out of chocolate Twizzlers so they were pretty stiff. Such a tasty recipe! I preferred it more when it's been at room temperature for a bit. Everyone loved it at the work Halloween party! Me and my mom did this project and it was a blast! We will definitely do it again. I made it for a Halloween party and everyone loved it! I haven't tried this but it is defiently on my list! This looks and sounds so delicious! I can't wait to try this! Thank you!